The reason for describing this interim case study here is to give an indication of how we work at Abledragon – giving as much free advice as possible and explaining in detail why we are taking whatever steps we take. Hopefully it’s useful! I’ve just finished a project with a beauty blogger in which they wanted to re-theme and re-position their blog in order to get more traffic and build up their business. This is a summary of the discussions we had up to the point where my part in the project was complete. It’s worth pointing out that my work was only to do the re-theming and re-branding of the blog. Everything else in this project was carried out by the blog owner, based on the discussions and advice that I’ve set out below. Some of that work was still in progress at the time of writing, which is why this is only an interim report. At our first meeting, I went through my usual list of questions to establish what the blogger wanted to achieve with this project. To earn money by selling affiliate products. “To which market do you promote your affiliate products?” I asked. “So why all these articles on male grooming?” I asked. “What results are you looking for as a result of changing your theme?” I asked. A better look and layout, so I can build up my business.
. . . and writing everything down in a plan. Because, for a small and new website (or blog), it’s important to be highly structured and focussed if the objective is to develop visitor traffic from the search engines – the sharper the focus the better. It’s OK for IBM or Apple or Microsoft to have large sprawling sites because those are household names – recognised authority sites in their market sector. (But I still find it extremely frustrating trying to find what I want on those sites, in more cases than not). A small site needs to make it very clear and easy for people to grasp what it’s about, and very easy for people to find what they are looking for. If your site visitors can understand that quickly, then so will the search engines. It’s a common mistake to believe that spreading the focus of a site as widely as possible will capture more visitors. In fact, the opposite is true. Creating a well thought out structure and keeping the content focused on a single subject (or very closely related subjects) should be at the front of mind for any blogger looking to develop a loyal and growing audience. An amusing side note: these discussions continued between us throughout the project, resulting in (at least to my understanding) a clear plan for the blog. Then, just as we completed it, they sent me an email with a subject line that said ‘Quick question’. And the question was: “Can we pop a shop plugin on the site?”. What products do you want to sell (knowing that they are already promoting affiliate products)? How many variations of each product do you have in mind? Which markets do you want to sell into (pointing out that to sell into EU markets they will need to register for VAT with the EU)? How many products do you want to sell? Which payment gateways will you use? Luckily, I have a very good rapport with the blog owner and we both had a good chuckle at the irony of that request coming immediately after completing all those discussions resulting in an agreed plan for the blog! To my opening point: the blog owner has a wonderfully creative mind, always full of ideas, but for their blog to do well (at least until they’ve built up a large audience) there has to be some disciplined planning and structure. So, in addition to finding and customising a new theme, we looked at some other areas – firstly the structure of the content on existing blog posts. A well-structured document (or article), whether online or off, is based on a framework that enables readers to scan the headings and sub-headings and get the overall message. Then, if they want to dive into a specific area for more detail, it’s easy for them to do so. This is more important online than off, because most people find reading documents on paper to be easier than reading them on a screen. So it’s all the more important to structure blog posts clearly and well. The same heading structure that’s available in Microsoft Word (or any word processing package) is used online: heading 1, heading 2, heading 3 and so on. I set out this in more detail in this article (you’ll need to scroll down to read the section on headings). To compound matters, none of those heading tags contained any content except for the H2 tags – and that content was 4 lines long. The search engine indexing crawler would arrive on that page, see that code and label the page as being of poor quality, which would force it down in the search results. The proper use of Headings and Sub-Headings in articles, as I set out on this page (scroll down for the section on headings), not only helps site visitors to digest your articles more easily, it adheres to the semantic tagging standards that the search engines expect to find when crawling and indexing web pages. So we had several discussions, constantly referring back to the article I linked to earlier, on how to structure articles in a way that is easily digestible by site visitors and in keeping with the agreed semantic tagging standards. The next area that we looked at was the organisation of the content on the site. Going back to the initial discussions, on planning and focus, one of the decisions taken was to focus specifically on beauty, with local women as the target audience. As a result, the blog owner decided to remove the articles on male grooming. This, of course, required a review of the categories and tags in use – which revealed some opportunities. Understanding the difference between categories and tags, as used in WordPress, takes some getting used to for people who just want to write, so we had some discussions around that. The analogy I use is to think of a filing cabinet: WordPress is your filing cabinet because it contains all your content. Then you have some drawers within your filing cabinet that are organised to contain different types of content – e.g. a drawer for your customers and a drawer for your suppliers. These are your categories. Within each drawer are some folders that contain more closely related content – e.g. your customers drawer will contain a folder for each customer, and your suppliers drawer will contain a folder for each supplier. These are your tags. This is described in more detail in this article. Using WordPress’ category and tag structure in this way enables you to file your content so that it’s easy for site visitors to find both what they are looking for and related articles. And if it’s easy for site visitors it will be easy for the search engines. 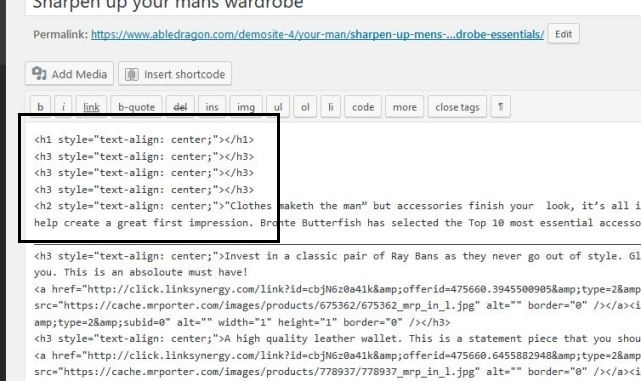 So the next step (which has not yet been completed) was to review the remaining content on the site (after deletion of the male grooming articles) and structure it with an effective category and tag structure. Ideally there should be no categories or tags with only 1 article. If there are, those orphan articles should be re-assigned and the now-empty category or tag removed. Why is this important? Because it helps your site visitors to find related articles on the same, or a closely related, subject. And if it helps your customers, it helps the search engines. What about all those deleted articles? Deleting lots of articles (the male grooming articles, in this case) will create a whole lot of broken links – both the search engines and humans will come up against the ‘404 Error – Page Not found’ message. While 404 pages are not an SEO disaster in themselves, a large number does have a negative impact. And, of course, incoming links to those articles will be lost (the number of incoming links is a strong SEO signal). Finally, site visitors are not left with a good impression when they come up against numerous ‘Page Not Found’ messages. So the solution, in this case, was to create a new, nicely worded page explaining that the site had been re-structured to provide a better and more focused experience and, as a result, the article being requested had been removed. Most importantly, this new page must contain two or three options for the site visitor to click or follow, with the aim of keeping them on the site if possible. The new theme contained a standard 404 page that works fine if someone types a link that doesn’t (and has never) existed on the site. But it doesn’t really cover the situation where numerous articles, ones that people may have been referred to or may even be returning to, have been deleted. Well, it does, but not in a particularly positive or friendly way – hence the new page. So once the URLs of the pages to be deleted have been listed, along with the URL of the new page, it will be a simple matter to set up the redirects. This will avoid numerous 404 errors by redirecting visitors (and the search engines) to the nice, friendly page explaining what has happened and offering them some options. Those were the main areas we talked about, as we moved through the project. All the reorganisation of the content and the cleaning up of the individual articles is being undertaken by the blogger, so, having completed the theme customisation, my work on this project is done. One point about SEO: the blog owner was very keen on SEO, frequently asking if this or that was good for SEO. But, while we covered the need for good titles and descriptions (more details here), and good quality content, I consistently steered the conversation back to the customer experience. Why? Well, with SEO it’s very easy to get sucked into infinite detail and all sorts of technicalities. But focusing on providing a good experience for the site visitor, by covering the things we discussed, will get you 80% of the way to where you need to be with SEO. If it’s good for site visitors, it’s good for SEO. 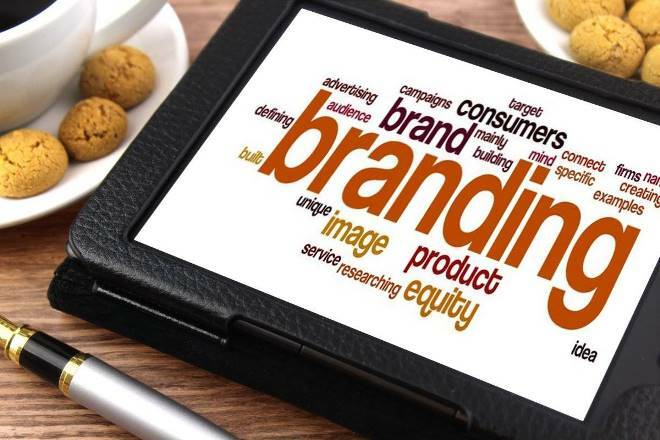 Clearly define the purpose of your site or blog – what do you want to achieve with this re-branding project? Because some of the steps (content tidying up and re-organisation) are still work-in-progress, it’s not yet possible to quantify the results of the project. But the blog owner is, at least, very happy with the new customised theme!